Think of ghosts as people without physical form in our plane. They’ll behave the same as the living… more or less, anyway. 4. People who seem to be alive & well in their own realities, whether that’s “heaven” or a parallel universe. Some know they’re visiting us; others don’t. In general, consider what might interest a living person, and cause him or her to approach you. 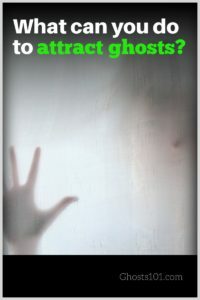 Don’t treat ghosts as if they’re aliens, hard of hearing, slow-witted, dangerous, or performers. Some ghosts are shy. Others have been taunted (or “provoked”) in the past. Be patient. Many ghosts courageously approach investigators and establish rapport. Then, those investigators leave and never return. Often, the investigators didn’t even say goodbye. Remember, ghosts have feelings, too. Treat each ghost with the same respect you’d treat a living person. Some ghosts quietly observe you before making themselves known. It helps to wait quietly for 20 minutes before investigating any location. The ghosts have time to get used to you. Theater ghosts are different. Usually, they respond well to direction. Politely tell the ghost what you would like him or her to do. In most cases, the ghost will do exactly that. What to Say. What to Ask. You may need to explain how to communicate with you. For example, you could tell him (or her) to knock once for yes and twice for no, or to speak through a device or an app. Are you [name of ghost]? Make a noise if you’re here. Is it okay for me to visit you? Before investigating well-known haunts, learn what’s been successful at that location. It may work for you, too. Start there. If you’re at a new location – one that other people haven’t investigated or reported about – experiment. Trial-and-error works. Also, take a variety of investigation tools with you, or plan several visits to establish rapport with whatever is there. Previous Previous post: Why do most ghost hunters investigate at night? Next Next post: Why do ghosts usually inhabit old, creaky and drafty buildings?